We provide products and services to the Oil and gas sector, Agriculture, Haulage, Coaches, Plant and quarry equipment, Marine, Construction, Forestry, Manufacturing, Automotive and Renewable energy. 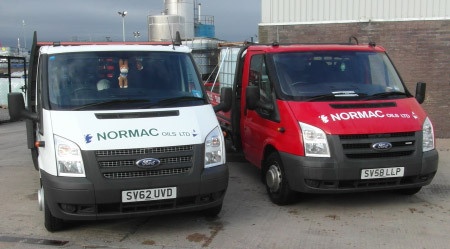 To compliment this we have a large range of compatible accessories, equipment and consumables making Normac Oils the perfect 'one stop shop' for almost all manufacturers grades of lubricants and grease. We have a full UK / global delivery network and full technical back up, product development opportunities through major oil and grease manufacturers, and welcome all enquiries. Copyright © 2019 Normac Oils Ltd. All rights reserved.